Miniature dachshunds are more susceptible to hypoglycemia. 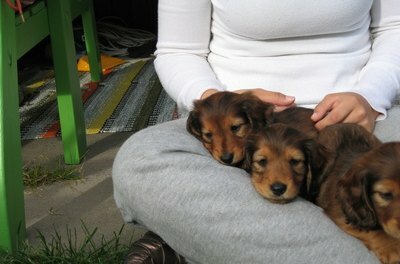 Dachshunds usually are little bundles of sausage-shaped energy. However, hypoglycemia can cause a range of health problems, including dachshund seizures. Learn the causes, symptoms and treatments for hypoglycemia to help your wiener dog flourish. Hypoglycemia, also known as low blood sugar, is a condition in which a dog's blood glucose levels become too low. Glucose is necessary for your dog's brain to function normally. Hypoglycemia can cause seizures and in severe cases can be life-threatening. 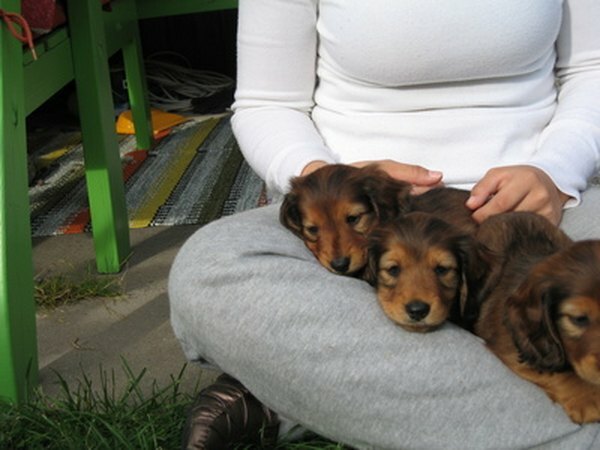 Hypoglycemia is more common in small dogs, such as dachshunds, because a small dog has less muscle mass. A dog's body uses muscle mass to control glucose levels in the blood, so a dog with a low body weight is at an inherently higher risk of hypoglycemia. The relatively small body and large brain of a dachshund places them at greater risk of low blood sugar as the brain uses a lot of the body's glucose. Miniature dachshunds are at greater risk of hypoglycemia than standard dachshunds, because of their even lower body weight and muscle mass. Puppies are more susceptible to hypoglycemia as their livers are less developed and less able to process and store sugars compared to adult dogs. Feed your dog regularly, giving appropriate quantities of a high-quality dog food. Dachshunds often do better if fed two meals daily, rather than a single meal. This keeps their blood sugar more constant. You can give snacks in between meals, but be sure not to overfeed your dachsie as excess calories over time will lead to weight gain. An overweight dachshund's back and joints will be placed under too much stress. If you have dachshund puppies, make sure that each is getting its chance to feed at the mother's teat, as in some litters, stronger dogs will bully smaller puppies away from the teat. If your dachsie is experiencing severe hypoglycemia, get some immediate sugar into your dog. Vanilla ice cream is rich in glucose, does not need to be chewed, and is absorbed quickly. A single teaspoon of vanilla ice cream is sufficient for a small dachshund. Although humans may use chocolate to relieve hypoglycemia, you must not give chocolate to your dachshund as chocolate is toxic to dogs. If your dog is experiencing only mild-to-moderate hypoglycemia, without having progressed to seizing, you can give a portion of your dog's regular food. Call for veterinary help if you feel your dog is having a medical emergency.